Berkshire Plastering take great pride in each and every one of their projects. An eye for detail ensures that our plastering service is characterised by a clean and smooth finish with well defined lines. This level of perfection leaves you free to choose how you would like to decorate, without having to worry about unsightly ripples or uneven angles. 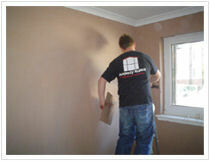 Our services include plastering, skimming and more. Utilising the best solution saves you time and money. The list below summarises our core plastering related services. What can I do if I have artexed ceilings and would like to make them flat? Is this an option and what would be involved? There are a two different options and which one would be most suitable for you would depend on the style and depth of the artex. The most popular option is to take down the existing artexed ceiling and replace with plasterboard. The ceiling would then be plastered to ensure a smooth and flat finish. The feasibility of the second option would depend on the style of artex. If the artex can be effectively skimmed, this may be an option and could easily be confirmed by a visit to your home. Skimming would involve covering the existing ceiling with fresh plaster and may require two coats of plaster. What are my options if I have taken off the wallpaper and have pulled some of the plaster off with it? This will depend on the amount of plaster that has come away from the wall. We would happily make a free home visit to ascertain what the best option would be for your wall. What can I do if I have a crack in my ceiling or wall? If the crack is not down to movement or subsidence we can skim over the surface to give you a flat and crack free wall. If there is a more serious underlying issue, this may need attention before the surface is replastered. What can I do if I have a hole in my wall? We can easily rectify any size of hole in the wall and ensure that this is filled and that the edges blend seamlessly with the wall for a complete finish. I'm having spot lights fitted in my ceiling and have the old light fitting hole left in the middle of the ceiling! What are my options? We can offer you two options. The first option would be to simply fill in the hole to obtain a smooth and flat finish, or we can fill in the hole and replaster the entire ceiling to enhance your new spot lights. What are my options if I have bumpy and uneven walls and would like them to be made flat? We can skim over your walls with plaster to leave you with a smooth and flat finish. Would it be possible to add coving to one of my rooms? By adding coving to a room you can enhance the look and feel and create defined lines. 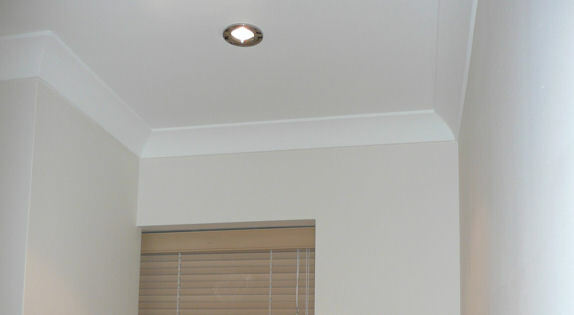 We can add coving to any room of your choice. I am having my skirting boards replaced and when I removed the old ones, I have pulled some plaster from the wall. Can this be rectified? The first thing that would need to be considered is the size of the skirting that you are replacing the old skirting with. If this is lower than the original, we can easily skim the surfaces to blend with the wall and allow a clean finish. I am having an extension built and need to find someone to dry line or plaster it. Is this something you can take on? Yes, we can provide a number of options dependant upon your budget and the finish that you require. For more detail on this, please do contact us directly. Can my bare brick wall be made smooth and flat? Yes, the most popular option is to apply plasterboard and create a very smooth finish with one layer of plaster or alternatively you could opt for just plaster but this may take several layers.